Winthrop Rotarians, Patrice Putman (VP) and Craig Hickman (President) each have received a Spirit of America Award from the Town of Winthrop. 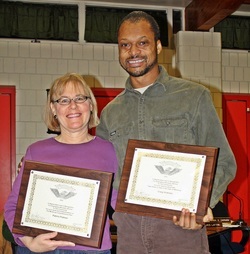 Patrice received the award for her work as chair of the Comprehensive Planning Committee for Winthrop, Craig "for your work to personally feed those in need in the Town of Winthrop." Spirit of America Foundation grants awards that honor volunteerism in "Recognition For Exemplary Altruistic Service To The Community."